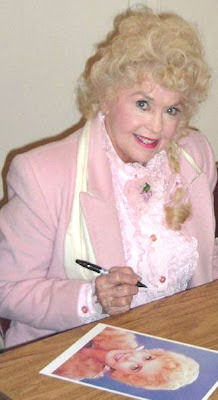 Elly Mae Clampett (Donna Douglas) that you may remember from the television show, Beverly Hillbilies, came to Wesley Court today. She is staying in our guest apartment tonight in order to speak at our Winter Wellness program at the Civic Center tomorrow. You may remember her from the actual television show (like I do) or re-runs. She played the ultimate hillbilly southern belle who had the softest place for "critters." She didn't bring any critters with her but she did bring an amazing amount of charm and grace. When she arrived, several of us walked over to her to welcome her with a hug. She looked at each one of us and said with all sincerity, "God Bless You." She is now 75 years old and has aged with dignity and grace. Donna did a few guest spots throughout the 1970s and even attempted a career as a gospel-country singer. 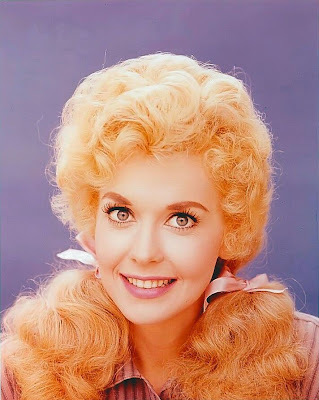 But her claim to fame rested in reruns and reunions of "the Beverly Hillbillies"
Donna resides in Los Angeles working in real estate and as a spokeswoman for animal rights. I look forward to hearing what she has to say to the group tomorrow. How fun!! I know you'll think I'm making this up but my daughter who is 13 came into my room today and asked if she can change her name when she gets older. Her name is Ellie and she said she would like to be Ellie Mae!! I say go for it. Older Crown Prosecutor, Jake Thorne (Dominic Rowan) is pulled in opposite directions if the chief suspect in case claims to own been framed for the murder through others within just his section. With a conspiracy of silence permeating the hospital staff, it’s clear that there’s more to this case as compared to meets a person's eye and only by penetrating the internet of specialized loyalties can the facts emerge. Visitor starring Wayne Fox and also Frances Melton. Who Says Cats Aren't Social?